Comments: Deciduous broadleaf native to Iran and central Asia. Grown commercially in California for its fruit. Large yellow-green pinate leaves with 5 to 9 leaflets. Broad spreading and adult height of 70'; makes it an excellent shade tree. 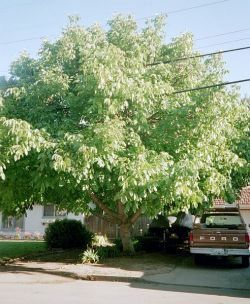 Almost all English walnuts are grafted to Black walnut root stock.